We're used to thinking of surround sound as being created by encircling the listener with several speakers positioned around a room. So how is it possible to create this effect using a pair of headphones? The Tritton AXPCs have four speakers inside each ear cup in place of the separate speakers that you'd position around your living room, and they can be individually adjusted using the inline controls. It's interesting that you don't need a soundcard to obtain 5.1 surround sound using these headphones - all the necessary hardware is contained within the inline audio controller. However, these cans connect via USB only. 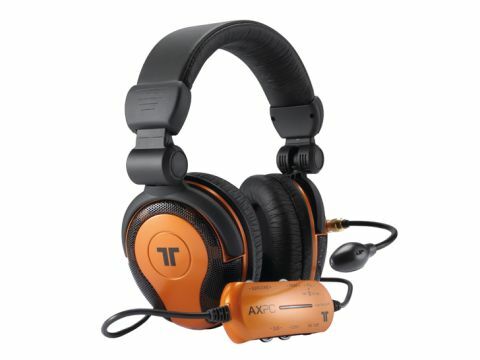 This aspect makes them handy if you want to use them to watch a DVD or play games on a laptop, but the downside is that if you have a PC with a good soundcard then these headphones won't enable you to make use of it. The inline audio controller has thumb wheels that make it possible to adjust front, centre, rear and subwoofer speakers individually. Volume is adjusted via a rocker dial that also works as a mute button when pushed in, and there's another muter for the microphone. The microphone is removable and the connector is gold-plated for better sound quality. There's also a rumble effect for use with games. The AXPCs do a convincing job of delivering immersive surround sound, but the major downside of these headphones is the design. They're huge - even with the headband adjusted to the smallest size - and most people we tried them on couldn't get a comfortable fit. Some of our testers found it impossible to get the ear cushions to sit properly, so they always seemed to be on the brink of slipping off. The AXPCs are designed with gamers in mind, and the price reflects this. If you're looking for a set of high-quality headphones for watching DVDs or listening to music then you may get a better deal by looking elsewhere.